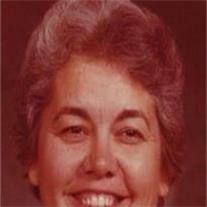 Gwendolyn Ann Rowley, passed away on February 21, at the home of her grandson. Gwen was born December 27, 1933 to Ila Myrle Jones and DeWitt Mincey in Bartow, FL. She was later adopted by her stepfather, Richard Dubian. She moved to Arizona when she was 9 and continued her schooling, graduating from Mesa High. She married Duane Rowley on January 25, 1951. She carried on her education at MCC and then went ASU to earn her BA and MA in education while raising 5 children and a husband. She taught English at MCC for over 15 years before retiring to enjoy time with Duane at their home in Christopher Creek. Gwen was very active in the LDS church. She had many callings including teacher and president of several auxiliaries. Gwen is survived by her children: Kim and Carol, Mike and Shauna, Kevin and Connie, Leanne, Lisa, 18 grandchildren and 33 great-grandchildren. Gwen lived a wonderful life of love and service to all who knew her. The visitation will be at the LDS Solomon Ward, 997 E Broadway from 6 – 8 pm on Friday, March 1st. Services will be Saturday, March 2nd at 10 am with a viewing one hour prior, also at the Solomon building. Arrangements by Bunker’s Garden Chapel. I came across Gwen’s obituary this morning in research into my dad’s family. It appears that she was a 2nd cousin of mine (once removed). In addition to expressing my sympathies for your loss — now nearing the 4th anniversary thereof — I wanted to ask as delicately as I could whether or not the family may still possess any records of any type (birth certificates, marriage documents, photos, etc) of her grandparents, Robert Franklin Jones and Anna Victoria Whitaker Jones. They were maternal great-great uncle and aunt to me, and our family has next to nothing by way of documentation on them. Your help could mean a great deal to our family. Thank you very much for any assistance you can offer. Foolishly I forgot to include in my previous note how you might contact me. You can reach me by my personal email: swinget@abwe.cc. Again, thank you very much.